Rebuff VC’s Full Blown Design to Shut Down JNU! 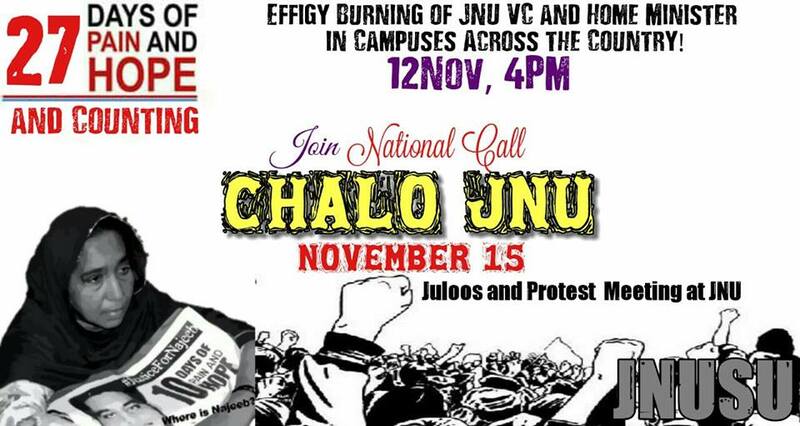 Strengthen the Ongoing Struggle – This is a Battle In Defence of Our Future, In Defence of JNU! 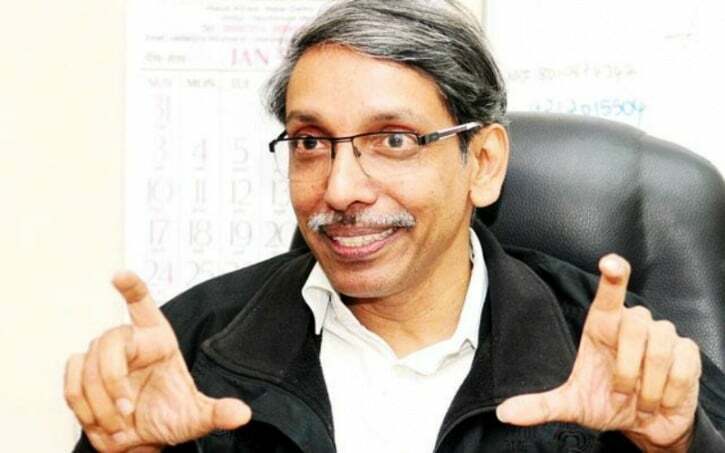 The JNU VC is shockingly announcing arbitrary decisions and fundamental changes in JNU’s admission policy and research programmes through press conferences – refusing either to discuss these in JNU’s decision-making bodies like AC, or to meet students’ and teachers’ representatives. It is now 17 days since JNUSU began an indefinite hunger strike against the arbitrary and unilateral imposition of the 2016 UGC notification by the JNU administration. For more than two months now, students and teachers have been raising crucial questions regarding this notification. Instead, the administration is threatening students with punitive action, when students worried about their future and about JNU’s research quality, are simply seeking explanations and answers. Friends, VC’s press statements & circulars have made it abundantly clear that he is adamant on (a) continuing with his unilateral imposition of the 5 May 2016 UGC Notification and (b) admissions in and conduct of JNU’s M.Phil./Ph.D. programmes will now be dictated by the arbitrary number of ‘supervisor-student’ ratio in the UGC Notification. JNU presently follows a system of “Annual Admissions to an integrated M.Phil./Ph.D.”, based on ‘Intake/Offer’ decided by different centres. But according to JNU VC’s interpretation of the UGC Notification, there will be no “fixed” seats in M.Phil./Ph.D. anymore – rather, seat availability will now be ‘dynamic’, based on the number of so-called “vacancies”- i.e. whether any faculty has fewer students than the UGC specified cap! Recall that initially, the VC had had been tweeting that protesting students are spreading “rumours” of seat cuts, and that there will be “no seat cuts” (despite several circulars and JNU website notices on ‘’seat cuts’’). Now he is trying to hide the ‘’seat cut’’ move with the jumla of ‘dynamic seats,’ admitting in effect that he had scrapped the very concept of a fixed number of seats, and so there is no question of seat cuts! It will mean Massive Seat Cuts in M.Phil./Ph.D. admissions as already notified through “negative vacancies” in JNU website (6 Feb onwards) and circulars (11/1/17 and 11/2/17) from Director of Admissions. 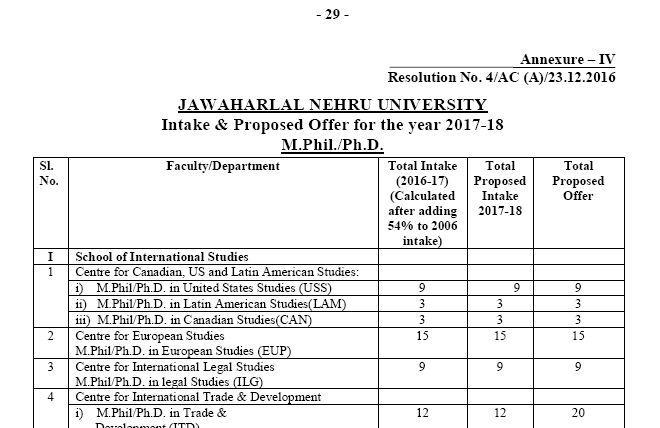 Here is link to JNU website showing ‘negative vacancies for admission’ – http://www.jnu.ac.in/Admission/SchoolwiseProg.pdf. A virtual closure to the existing system of Annual Admissions for M.Phil./Ph.D. for all batches to come. A body blow to the scope for “reservations” as the so-called ‘vacant’ seats will arise only in small numbers and not in annual bulk. Dismantling the “Integrated” character of JNU’s M.Phil./Ph.D. Programme, as according to VC’s new ‘formula’, continuation in Ph.D. will be will no longer be guaranteed by CGPA scored in M.Phil., but will based on whether number of students under a supervisor is below the specified limit! Discouraging students and downgrading research: Supervisors to be allotted not on the basis of students’ area of choice or faculty’s area of expertise, but only on whether a faculty has fewer students than the UGC specified cap. Thus, not only those who aspire to get admission in JNU for M.Phil./Ph.D, but also those who are already admitted in M.Phil./PhD. 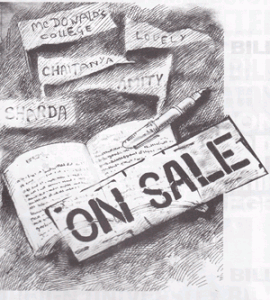 program are under a massive survival threat because of VC’s authoritarian step. Firstly, the present number of seats in JNU has been fixed as part of the implementation of OBC reservation and the concomitant expansion of seats, infrastructure and faculty (during 2008-10), mandated by the 93rd amendment of the Constitution. Even the agenda of 142nd AC Meeting includes the “intake/offer” list of admissions based on this 93rd Constitution amendment (i.e., 54% increase in intake of 2006- the base year for calculating expansion for OBC reservation), which the VC is now trying to negate. So the VC’s move to tamper with JNU’s existing Intake/Seats/Admissions is plainly unlawful and cannot be accepted. Secondly, cutting down admissions is not the only way to ensure a certain “supervisor-researcher ratio” – the answer is to recruit adequate faculty. Why should the students be made to suffer and why should future research avenues be curtailed? 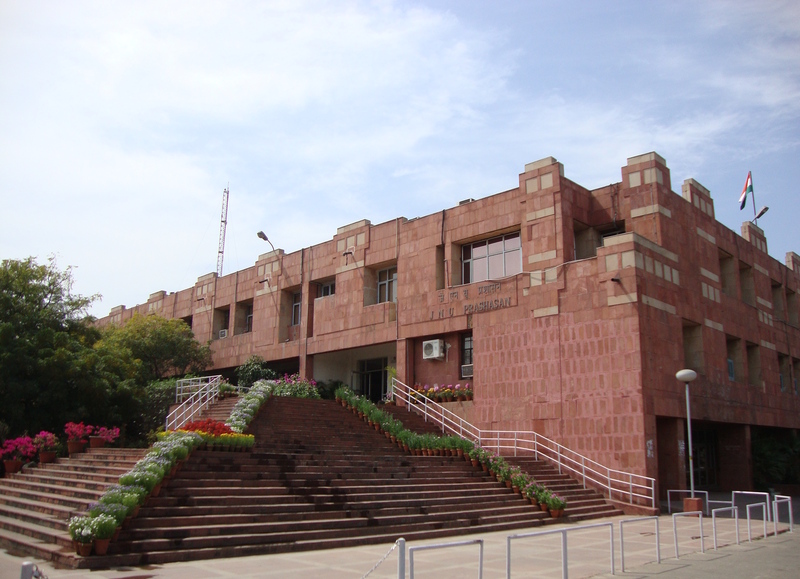 Thirdly, when JNU with its present “faculty-student” strength has been rated as the best Central University and when no teacher is complaining of any “overburden” and are in fact are opposing seat cut, why is the VC so keen to shut down admissions in JNU’s research programmes for several years to come? Fourthly, research students cannot be allotted a supervisor just based on the fact that the supervisor is now guiding fewer than the ‘specified’ number of students! Supervisors are allotted based on their field of expertise and the student’s chosen field of research. Imposing an abstract ‘numbers’ rule will spoil JNU’s record as the best Central University because it will be a body blow to the quality of research supervision and discourage students to pursue research as per their academic interest. Fifthly, VC’s claim that all provisions of social justice are being retained in JNU is also another jumla and white lie on at least two counts: (a) the VC swears by the UGC notification which fixes uniform 50% marks to qualify the written exam without any relaxation for the reserved categories and JNU has not announced the mandated “relaxations” for students from deprived backgrounds at each and every stage of elimination in the admission process, despite a categorical verdict from the Delhi High Court- the Gautam Sharma Vs. JNU (19 Jan 2016); (b) VC is making JNU’s unique system of deprivation points in fructuous, by adding it after the viva stage when the students from deprived backgrounds and areas have already lost out in the initial stages of a “multi-stage elimination” based admission process. In no way can the JNU VC alter the current criterion of admission and continuing in M.Phil./Ph.D. and bring in ‘’supervisor-researcher’’ ratio as a precondition, and that too without being discussed or decided by the University’s statutory bodies such as the Academic Council. The VC, instead of addressing the crisis situation and questions from students and teachers, is only interested in peddling falsities to the media. Firstly, the UGC Notification is an issue which directly affects the students and hence needs to be placed for discussion in Part A of the AC meeting, where students participate. But this was not done, and it was placed only in the Part B of 142nd AC meeting, where there is no student representation. And the teachers have testified in unison from the very day of the AC meeting, that UGC notification was neither “discussed” nor “approved” but bulldozed in the part B of 142nd AC meeting! 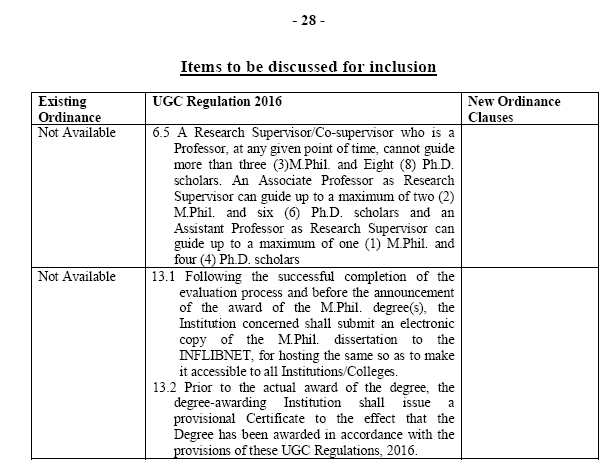 Secondly, on a closer scrutiny of administration’s own version of the “Agenda and Minutes of 142nd AC- Part B”, it is amply clear that the specific clause of “supervisor-researcher ratio” in the UGC Notification was kept as a separate item in the agenda under the title “to be discussed.” The “minutes of 142nd AC- Part B”, circulated by the administration, do not record any “discussion” or “adoption” of this specific clause of the UGC Notification. When, even as per administration’s own version, the “supervisor-researcher ratio” clause of UGC circular has not been “adopted” by JNU’s AC, what is prompting the VC to interpret and impose it through arbitrary circulars and press conferences? Below are relevant images of Pg 10 and 28 of the “Minutes of the Part B of 142nd AC meeting”. 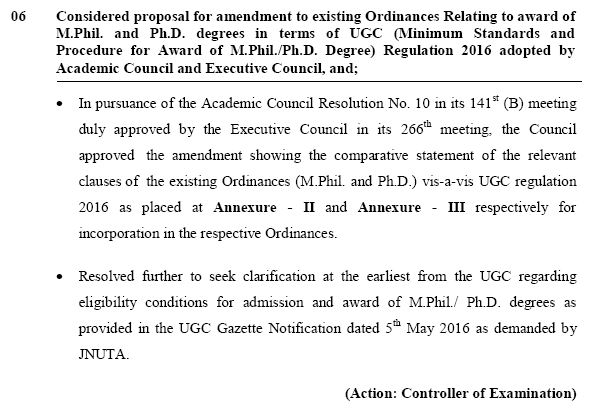 The minutes in Pg 10, point 6, claim that UGC Notification was adopted as reflected in the relevant changes in JNU’s M.Phil./Ph.D. Ordinance attached in Annexure II and Annexure III. The elaboration in the Annexures II & III of the Minutes show that 2 clauses of UGC Notification – Clause 6.5 related to Supervisor-researcher ratio and 13.1 & 13.2 related to award of degree – were listed separately as “items to be discussed” and that there is NO recording against these items as “discussed”/”resolved”/”adopted” for changes in JNU’s M.Phil./Ph.D. ordinance, as indeed no discussion took place at all on these and so there is no question of any adoption of these clauses of UGC Notification as is being claimed by the VC! Thirdly, as per JNU’s Act and Statutes, admission policies and ‘intake/offer’ of seats of admissions are to be discussed and decided through Centre-level, School Level Board of Studies and finally the Academic Council Meetings. 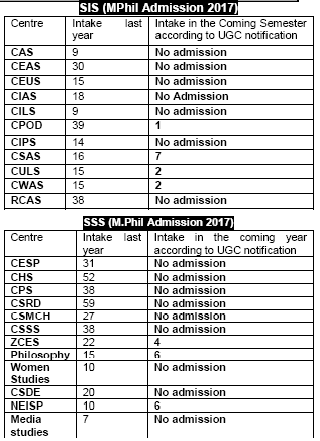 Let us emphaise that the even agenda of 142nd AC Meeting includes the “intake/offer” list of admissions proposed by different centres, based on this 93rd Constitution amendment. This is what VC is trying to suppress and deny. Indeed, the VC seeks to replace all due forum and process through his incessant arbitrary circulars and Press Conferences, where he is both announcing and interpreting crucial policies as per his whims and fancy. The sanctity of all the forums and statutory decision making bodies of JNU like the AC are being trampled upon and a dangerous precedent is being for the entire institution and our collective future. VC cannot be allowed to act like a tyrant of feudal ages, as JNU is not his fiefdom nor are students and teachers his subjects. So the 142nd AC needs to reconvened to uphold the sanctity of JNU’s mandated decision making process. With the VC’s grossly arbitrary and anti-student actions threatening to wipe out the admission prospects for the coming session and possibly several coming years in M.Phil./Ph.D., and also endanger the future for the existing students in M.Phil./Ph.D., we have no other means but to fight back to save our future and also the future of JNU. JNUSU appeals to the student community to join and strengthen the ongoing struggle until the VC reconvenes the 142nd AC meeting and arbitrary impositions of the UGC notification is revoked. This is a JNUSU Release. Spells Massive Seat Cut in JNU’s M.Phil./Ph.D. Admission and Scuttling of Social Justice in the Admission Process! Reconvene 142nd AC Meeting! Reject UGC Notification! Stop Seat Cut! Reduce Viva Weightage! The Background: The JNU Vice Chancellor convened the 142nd AC meeting during the winter break on 23 Dec 2016, violating all norms and ignoring legitimate objections from teachers and students that AC meetings should not be held during vacations when several members of AC were out of campus. In the earlier AC meeting held in October, the VC promised to convene a special AC meeting within the semester to finalise the decision on the reduction of viva weightage. However, in the AC meeting of 23 Dec, instead of adopting the Viva Committee (Prof. Nafey Committee) Recommendations of reduction of viva weightage from 30 to 15, for which the AC was primarily meant, the VC suddenly forced the ‘adoption’ of a UGC notification of 5 May 2016! With this single stroke, the VC not only nullified the hard work and long awaited recommendations to reduce viva weightage, he also sought to overhaul the entire admission process for M.Phil. /PhD. JNU’s present admission process – marked by the unique deprivation points system and the latest recommendation for viva weightage reduction – can serve as a model for inclusive and socially-just admissions for any university. The VC, through his unilateral imposition of the UGC notification, has dealt a body blow to JNU’s admission process for its entire research programme, by cutting down seats in M. Phil / Ph.D. as well as scuttling social justice in the admission process. What will the ‘adoption’ of the UGC notification mean for JNU’s M.Phil./Ph.D. admission process, research programme and the socially inclusive character of the university? “Accordingly the number of students intake for M.Phil./PhD programmes will be recast on the basis of faculty strength of each school/centre/special school as per clause 6.5 of the above said UGC regulation”. This is a clear farmaan for drastic SEAT CUT in the upcoming M.Phil./Ph.D. admissions jeopardising the admission opportunity of hundreds of students of JNU and elsewhere. This Seat-Cut formula has to be robustly resisted. JNU administration must be categorically told that UGC-dictated cap of restricting M.Phil./Ph.D. admissions based on existing faculty strength has no logic so far JNU is concerned. Firstly, with its existing intake capacity, JNU is rated as a top university in research for decades by all “quality” indices. So what’s the need to impose the UGC-dictated cap on admissions in M.Phil./Phd.D. research programmes? Secondly, the JNU faculty is not complaining of ‘overburden’/’excess research scholars’; on the contrary, they have forcefully opposed the UGC notification. So why is the administration so keen for SEAT CUT in M.Phil./Ph.D. admissions? Thirdly and more fundamentally, is it correct to restrict admissions/enrolment in higher research based on the existing faculty strength? Or, the govt must plan to expand faculty strength in research programmes depending on the expanding number of new aspirants? It is evident, that illogical the UGC notification is meant to trigger a downward spiral and steady reduction in the number of research scholars in the coming days and is only reflective of BJP govt.’s dangerous political agenda of somehow strangulating higher education and research in the country. Last year, BJP govt attempted the same by trying to withdraw Non-NET fellowship; this year they have struck back with this UGC notification to curb access to higher education and research. When it is the need of the time to expand the scope of higher education for the vast majority of the Indian youth and make it accessible to the most marginalised section of the society the UGC notification is being used for reducing the existing inadequate number of seats and scuttling social justice. The UGC circular claims that it is putting ‘guidelines’ in place to ensure ‘quality’. 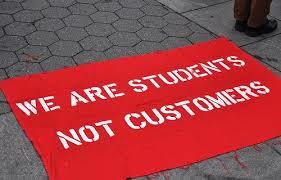 The fact is: in the name of quality, the UGC is punishing students for NO fault of theirs. If there are not enough faculty members WHO is to be held responsible? Aren’t University administrations and the MHRD/UGC ultimately responsible for this? Why should students suffer because the MHRD has an agenda to kill publicly funded, affordable, quality higher education in India? The excuse of ‘quality’ or inadequate faculty cannot be used to reduce the number of students. The solution towards better ‘quality’ would be to increase investment in higher education, finish contractualisation of faculty posts, and guarantee fair appointments. But the MHRD/UGC are least interested in doing any of these. Till 2016, the eligibility criteria for applying to JNU’s various programmes was decided by individual departments, depending on their requirements as well as past experiences. The minimum qualifying marks demanded by various programmes range from 45-55% (in MA for admission in the M. Phil programme, for instance). Also, relaxation in these eligibility criteria is provided to students from the PH/ SC/ST/OBC categories. As per the UGC circular all candidates to all M. Phil programmes will have to get a minimum of 55% in MA. The uniform 55% benchmark would clearly restrict several students from marginalized backgrounds from even appearing in the entrance test for M. Phil/Ph.D. All Universities have the right to decide their admission requirements, based on the specific nature of the programmes they offer. Several court judgements have upheld this right – the MHRD or the UGC cannot decide a single ‘eligibility’/selection criteria which has to be adopted by Universities all over the country. In other words, a “one-shoe-fits-all” philosophy is completely unacceptable, as this will destroy the ability of individual departments and Universities to cater to diverse students as well as research interests. In JNU, till now, in order to be called for the viva voce for M.Phil. admissions, students need to obtain a minimum marks (35% for unreserved categories, 31.5% for OBCs and 25% for SC/ST/PH out of 70; http://www.jnu.ac.in/Admission/AdmissionPolicy.pdf) in the written exam. 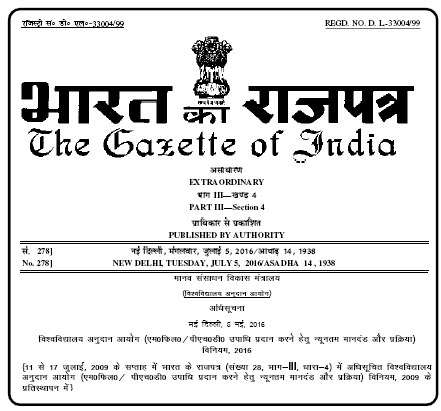 Students from PH/SC/ST/OBC categories get legally mandated relaxation in this minimum eligibility criterion. According to the UGC circular, all students now have to obtain a minimum of 50% marks in the written exam, with no mention of relaxation to students from marginalised backgrounds. Clearly, this will DRASTICALLY reduce the number of students eligible to even be called for the viva! In other words, JNU will not be able to fill the seats it has in various programmes. Seats reserved for SC/ST/OBC/PH will obviously see the heaviest casualties. The JNU Vice Chancellor is trying his best to go even one step ahead from the UGC in scuttling social justice and inclusive admission policy. 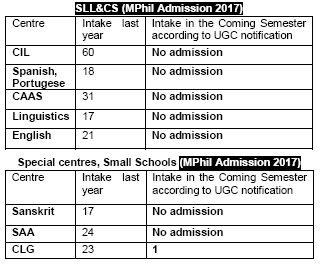 The UGC notification states that the M. Phil /PhD admission will be based on a two step entrance process consisting of written and viva. It also states that written test will be a qualifier. In JNU entrance for integrated M. Phil/PhD is already a two step entrance test and a qualifying mark is fixed. Nowhere does the UGC notification mention that the written will be a mere qualifier. The Vice Chancellor’s attempt to replace the Nafey committee recommendations to reduce viva weightage from 30 to 15 by the UGC notification is nothing but a deliberate attempt to escape his responsibilities in reducing viva weightage. The Vice Chancellor clearly intends to “over read” the UGC notification by making written test a mere qualifier. That would mean viva will carry 100% weightage in making the admission list. It is more than clear that it is the Vice Chancellor’s denial to address the structural discrimination in high viva weightage and not the ‘obligation’ of the UGC notification that has stopped the AC to accept the Nafey committee recommendation. The imposition of the UGC notification would act in grossly undermining JNU’s unique deprivation point policy. If the UGC notification is interpreted to mean that the written examination will merely be a qualifier then surely the question comes how deprivation points will be given. In this motivated reading of the UGC circular if deprivation points are given at the level of written test then the points will not be added in preparing the final merit list. If the deprivation points are given after written test then the points will be meaningless in ensuring that students from deprived backgrounds make it to the viva. 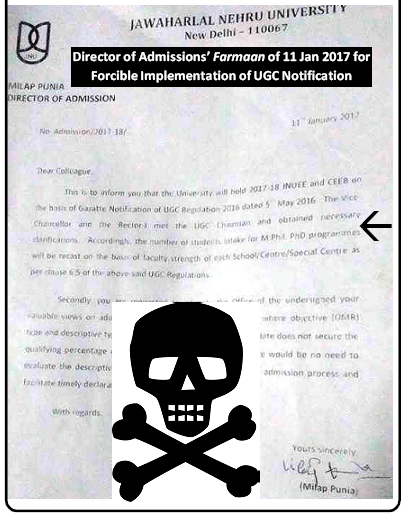 In sum, the UGC notification is in reality a “strait-jacket” with rigid examination criteria, admission rules and the criteria for the eligibility of research supervision. JNU administration, by blanket and forcible imposition of the UGC notification, has severely compromised the university’s autonomy and is working to destroy the unique inclusive features of JNU’s admission process won through struggles by generations of students’ movement in the campus. 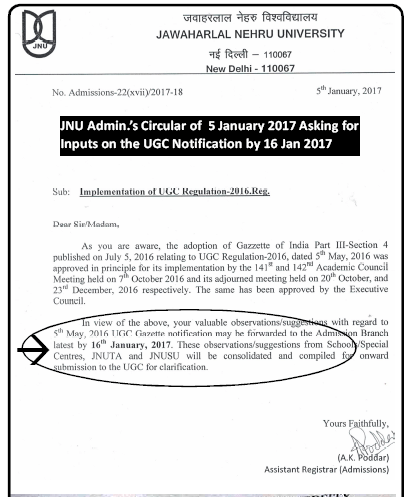 After the so called ‘adoption’ of UGC notification by the AC and EC, the admin was forced by growing opposition to send a circular on 5 January 2017 asking for inputs on the notification by 16 Jan 2017. However, without even waiting for the inputs to arrive, the Director of Admissions sent another farmaan to centres on 11 January 2017, this time virtually ORDERING the centres to IMPLEMENT the UGC Notification and accordingly RECAST (read REDUCE) M.PHIL./PhD. seats for the upcoming admissions and overhaul the admission process. Clearly, this undue haste is to placate the saffron masters whose whole and sole agenda is to commercialise and saffronise higher education in general and target JNU in particular. Serving the Saffron Agenda: Now SHUT DOWN JNU-Part III? For past one year, JNU has witnessed unprecedented attacks and crackdowns. Last year, in the month of January, Prof. M Jagadesh Kumar took over as Vice-Chancellor of JNU. Within weeks of his joining, the campus witnessed an unprecedented crisis with Delhi Police being given a free hand to raid the campus, witch-hunt political activists, arrest at will without the VC demanding to even see the evidence or any warrant before allowing such action. The saffron brigade gave the call for “Shut Down JNU” and the new VC was seen dancing to the sanghi tune. This was the phase of Shut Down JNU-1. The VC was welcomed with a befitting resistance by students and teachers which introduced him to the spirit of JNU. We again witnessed a fresh round of attacks by the JNU admin on students and teachers from the beginning of the last semester: the phase of “Shut Down JNU II”. The JNU administration shamelessly used threatening and intimidating tactics as well as victimizing teachers and delegitimizing JNUTA, who have spoken out against the policies of govt. crackdown on universities. The security guards were instructed to record any political cultural programs, public meetings and academic activities. Flouting every established norm, the JNU administration tried to change the seniority criterion of appointing Chairpersons in the centers. Agreement with the vision of VC instead of the seniority is being established as the criterion to appoint the Chairpersons. In the name of the lack of “vision”, teachers from the deprived sections are being removed from Chairpersons. The highest number of notices ever served in the past year to student activists, including former and current Union office bearers at each instance of protest, including, burning of an effigy of Gaurakshaks and the Gujarat Government, observing May Day among other protests. Najeeb Ahmad, a minority student disappeared from the campus after facing violence from a group of communal lumpens. 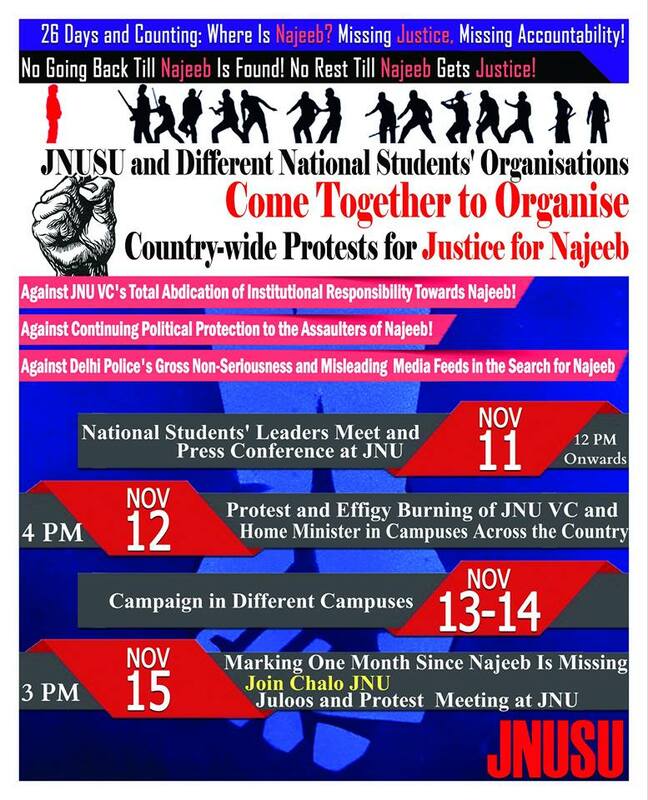 The VC has shown complete inaction in finding Najeeb. He has given green signal to ABVP lumpens to freely indulge in violence and intimidation by refusing to punish Najeeb’s assaulters even after they have been proven guilty of assaulting and threatening Najeeb in the Proctorial enquiry. Threats and intimidation of student activists and faculty members for protesting at the Administration Block has reached a new height. JNU admin also understood that, in order to convert JNU campus into an RSS shakha, it is imperative to destroy the structures and policies that make the campus an inclusive and egalitarian space. That is why the most recent round of attacks has been unleashed by the VC, a bid at Shut Down JNU part III. To kill JNU from within, the VC has now imposed the 5th May UGC notification, which will result into massive seat cut, 100% viva weightage and destroy the unique deprivation point of JNU admission policy. The student community in JNU has fought several struggles in JNU to ensure a more inclusive and democratic admission policy. In the early 1990s, the deprivation point system was brought back. More recently, this unique system was expanded. In JNU, we have fought a long battle for ensuring the proper implementation of OBC reservations, and defeated JNU’s illegal “cut-off” criterion for OBC admissions both in the Delhi High Court (7 Sep 2010) and then again in the Supreme Court (18 Aug 2011). We have ensured recognition of Madarsa certificates in JNU. The BJP-RSS is hell-bent on destroying campuses like JNU, destroying higher education altogether. In the 2016-17 Union Budget, a massive 55% fund-cut to the University Grants Commission (UGC) has been announced. At a time when at least 10% of the budget allocation should have been on the crucial education sector, the budget is now a mere 3.7% and is being viciously slashed every year. The effects of these massive fund-cuts are there for all of us to see and experience. Just last year, the MHRD dictated UGC’s move to end Non-Net Research Scholarship was resisted and defeated by the massive “Occupy UGC” movement. The Draft of the National Education Policy 2016 of the Modi govt clearly shows the government’s plans to kill every possibility of equal standards of education for everyone. In the name of Open school and colleges and vocational/skill training, the government has chalked out a blue print of low standard and curtailed education for students from disadvantaged background. Massive commercialisation is being proposed in the form of Private Public Partnership. In these dark times, we can’t and must not allow the stooges of the government, the JNU administration, to push through this anti-student, anti-social justice, anti-democratic UGC circular. The collective gains of the student community in the form of deprivation points, reservations and recommendation for reduction in viva weightage cannot be allowed to be washed away. We must ensure that the 142nd AC meeting is reconvened, the unilateral acceptance of the UGC circular is revoked and the 5th May Gazetteer notification is withdrawn by the UGC. Rebuff JNU VC’s Overenthusiastic Attempts to Impose the 5th May 2016 UGC Notification- the Blueprint for Seat Cut and Social Exclusion! 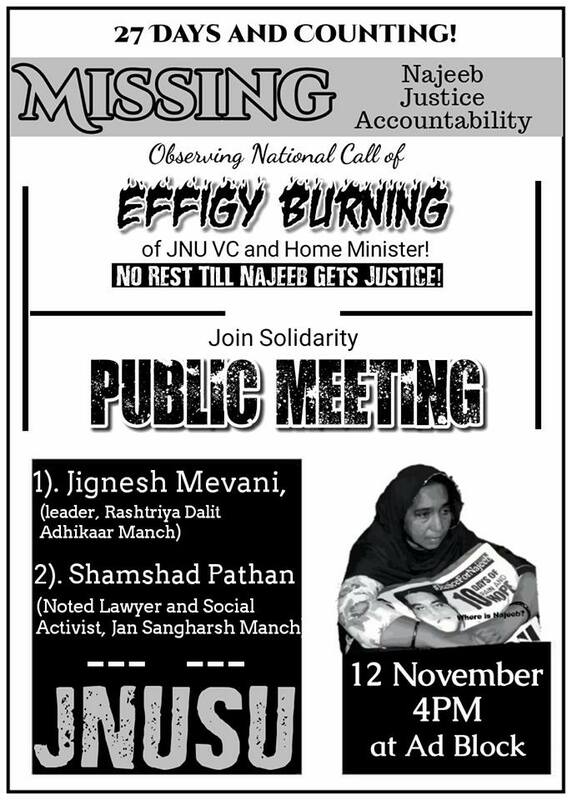 We Must Fight Back Now, Fight for a Socially Inclusive JNU!! ‘Achchhe Din’ Unfolding: 150% Hike in Application Fee for UGC / CSIR NET-JRF from June 2015 ! CSIR has already notified …. Roll Back Massive Fee Hike in NET-JRF Exam Fee! The reality of Modi sarkar’s promised ‘achchhe din’ unveils itself every single day. The latest is of course the huge 150% increase in application fees for the UGC/CSIR NET-JRF: the fees have been increased from Rs. 400 to Rs. 1000 for general category candidates, from Rs. 200 to Rs. 500 for OBC candidates and from Rs. 100 to Rs. 250 for SC/ST/PH candidates. The CSIR has already notified this hike. This is a move which will clearly prevent several students from deprived backgrounds from applying for these exams, especially as students often have to appear several times for these exams before they qualify. Ever since the Modi government has come to power, we have seen a clear pattern in the policy decisions. For students and youth, every avenue of stable dignified employment and quality public education is being shrunk. The govt started its innings by brutal crackdown on students and youth protesting against the discriminatory CSAT pattern in the UPSC exam. Then, came the job cuts in the banking sector, when a 10% cap on waiting list of qualified candidates was announced in the IBPS exam. Next, 13 ESIC medical colleges were closed down and the CSIR announced shunting out of hundreds of Trainee Scientists. Along with these moves, is the grand design to nullify the autonomy of central Universities like JNU, DU and imposing an overwhelming uniform central University Act, uniform syllabus and transferrable faculty, in short, subordinating the unique quality and content of different universities to the saffronised regime! For the vast majority of farmers and working people, Land Grab Ordinance has been imposed at a midnight stroke, MNREGA schemes and food security provisions restricted and all labour laws meant to safeguard minimum wages and labour rights are being jettisoned. Sovereignty, safety and life-security of our people are being dangerously compromised under US diktats: India’s patent policy is being diluted to facilitate US big Pharma lobby that will stall the manufacture of several generic and life-saving drugs in the country and escalate their prices hundred fold for our people. Simultaneously, under the garb of so-called ‘breakthrough’ in Indo-US nuke deal, the civil nuclear damage liability law is being secretively diluted to free the US nuclear suppliers of compensation and damage suits in case of nuclear disasters. Indeed, revision in IPR (patent) policy and nuclear damage compensation provisions are two critical concessions that Modi has handed over to the US during the Obama visit. While the govt is maintaining a veil of ‘secrecy’ on these massive sell-outs to US to avoid domestic backlash, several US representatives are already boasting of the ‘concessions’ they have extracted from the Modi govt! This anti-people, anti-India policy package is being bolstered through massive mid-term cuts in all social sector budgetary allocations of 2015-14: the Rural Development budget slashed by a whopping 25%, the education budget facing a Rs 11,000 crore CUT, and the already small health budget cut by more than Rs 6,000 crores! What we are seeing under the hype of Modi’s ‘Make in India’ is an unmaking of our collective futures. It is an unmaking of public infrastructure, public funded schools, universities, research institutions and hospitals, an unmaking of labour rights and environmental protection, an unmaking of rural development, food security, land rights and livelihoods. The hikes in the UGC/CSIR application fees are NO aberration. They are a part of the systematic policy of the Modi Government. We must expose and oppose every single move which denies rights and deprives common people, students and youth from access to quality education, dignified employment and healthcare. JNUSU appeals to the student community to participate in large numbers in the protest demonstration TOMORROW (20 February 2015) at the UGC office to protest against the hike in UGC/CSIR NET/JRF application fees, demand commensurate increase in Non-NET scholarship amounts and inclusion of Korean language in NET/JRF. The Modi sarkar promised ‘achchhe din’ for India’s youth, in order to come to power. But instead, students and youth as well as poor and working people are facing times that seem to become worse with every passing day. Every day of Modi Sarkar brings job cuts, shrinking opportunities of dignified and stable employment, Ordinances to facilitate land grab from the poor peasants and adivasis, proposed cut-backs in food security coverage, and billion dollar loans from public banks to crony corporates like Adani! It is amply clear that the Modi regime intends ‘acche din’ for the super-rich corporates who funded his massive media make-over – but the worst possible days for ordinary people. This govt’s tenure started with the betrayal of and police brutality on students protesting against the discriminating pattern of CSAT in UPSC. Then came the covert job cut in IBPS through 10% cap on waiting list of qualified candidates. Now, in a fresh set of assaults on avenues of public funded education and research: CSIR-UGC NET-JRF application fee has been hiked by a whopping 150%, 13 ESIC medical colleges are being closed down, CSIR has announced shunting out of hundreds of Trainee Scientists! 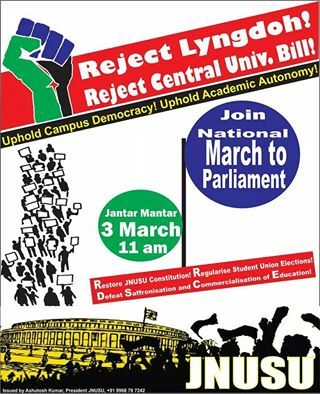 Even as the Lyngdoh committee recommendations continue to scuttle students’ democratic rights and campus democracy, the central government is mooting an extremely dangerous piece of legislation to do away with all the autonomy of central Universities. 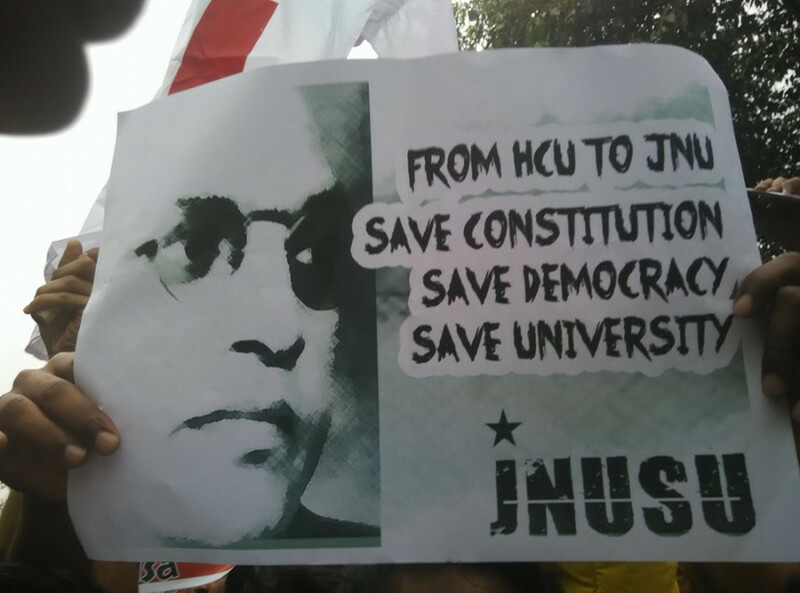 Proposals to Destroy University’s Autonomy: Under the new government, the UGC has proposed a new Bill that seeks to nullify all the Acts which created individual universities such as JNU. As per this proposal, existing acts such as the Jawaharlal Nehru University Act 1966 will be replaced by a SINGLE overarching Act – which will guide all the decisions and functioning of all central universities. Clearly, this is a calculated move to destroy the unique character, autonomy and academic independence of educational institutions. Through this legislation, everything from faculty appointments, entrance exams for students, academic curriculum and policies will be micromanaged and dictated by the Central Government, according to the whims and fancies of the MHRD. There are several highly problematic clauses in the proposed legislation. For instance, there is a clause to allow the arbitrary transfer of faculty members across Universities, which will not just compromise academics but will also open the doors to vindictive punishments of faculty members who raise their voices against the establishment. Moreover, the Act is designed to make it easier for the MHRD to manipulate syllabi and course content in all universities and thus force their own version of ‘history’, ‘culture’, ‘science’, economics and ‘skill development’. We are all witness to the manner in which ideas of RSS ideologues such as Dinanath Batra are being promoted by the present MHRD, and this move is clearly a step in the direction of institutionalising the likes of Batra in our syllabi! This Act moreover goes against the fundamental democratic principle that each University should be allowed the space to independently analyse and respond to local, national, regional and international events. Assaults on Public-funded Education and Research: In the recent past, the Modi government has taken several decisions to further curtail public-funded education and research. 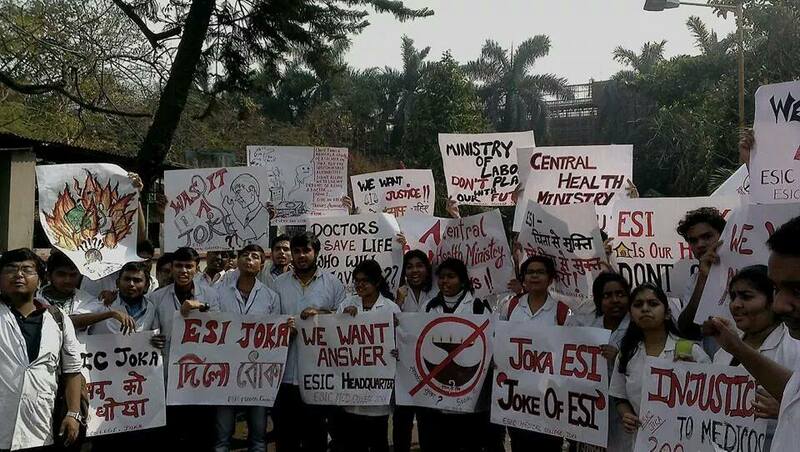 13 medical colleges run by the ESIC are being arbitrarily shut down. This has jeopardised the future of several students, and is a massive wastage of medical college infrastructure built through public funds. This is in fact part of the government’s plan to systematically weaken quality health care in ESIC hospitals. What we are seeing under the hype of Modi’s ‘Make in India’ is an unmaking of future of medical students and teachers, unmaking of public infrastructure in medical education and unmaking of health care provisions for workers. And now, in a new move, the CSIR has undermined its own recruitment policy and arbitrarily shunted out 250 CSIR Trainee Scientists! CSIR refuses to appoint them as Scientists, even after they fulfil all eligibility criteria. In 2011, CSIR amended its Scientist Recruitment and Assessment Rules of 2001, allowing the Trainee Scientists recruited in the 2 years training program to be eligible for appointment to the level of Scientist (Scientist IV(II)) on completion of training with distinction (above than 8 CGPA). Now, the CSIR has simply kicked out those who had joined under this programme. CSIR has stopped emoluments of Trainee Scientists since August 2014 without any prior notice and reason. CSIR is not even ready to give them an M. Tech degree, let alone the promised appointment as Scientists, despite 2 years of rigorous lab based research after graduation. 150% Increase in Fees for UGC/CSIR NET-JRF Exam: The application fees for the UGC/CSIR NET-JRF has been increased from Rs. 400 to Rs. 1000 for general category candidates, from Rs. 200 to Rs. 500 for OBC candidates and from Rs. 100 to Rs. 250 for SC/ST/PH candidates.CSIR has already notified this hike. This will clearly prevent several students from deprived backgrounds from applying for these exams, especially as students often have to appear several times for these exams before they qualify. Lyngdoh Committee Recommendations (LCR): Even as these anti-student moves are being forced on students and youth, the LCR continues to be used to curb the organised student movement. The MHRD refuses even to entertain demands that a comprehensive review of the LCR be undertaken – given the experience of implementing the LCR across the country. This, despite the fact that the Supreme Court judgement on the LCR itself allows for such a review. JNUSU is presently in midst of campaigns in different parts of the country against LCR and for Campus Democracy. As part of this campaign JNUSU and its teams are visting various campuses in the country holding meetings with students, student unions and student organizations to mobilize them against the LCR towards a national mobilisation in Delhi during the upcoming Budget session. We can overlook or ignore the pattern only at our own peril. It is simply an all-out war on public-funded education and research, on the democracy and autonomy of institutions and student bodies, on the future of students and youth. The present context demands concerted mobilisation and resistance.